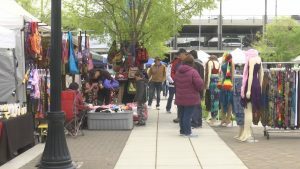 MEDFORD, Ore. – 66th Annual Pear Blossom Festival kicks off Friday and thousands are expected to attend in downtown Medford. From Saturday’s parade to the two-day street fair that began this afternoon to Saturday’s runs, there is something for everyone at the 2-day event. The “Pear A Fare” street fair at the Commons kicked off at noon Friday, bringing out vendors featuring locally produced wines, brews, foods, and specialties. Pear A Fair will run until 10:00 p.m. Friday, and start up again Saturday morning at 10:00 a.m. before ending at 5:00 p.m. The Pear Blossom Festival golf tournament will be held on Saturday at Eagle Point Golf Club and Sunday at Centennial Golf Club. Shotgun start is at 9:00 a.m. both days. The Pedals N Pear bike race kicks off at 9:00 a.m. Saturday. Three Pear Blossom Run races start Saturday morning. The 5K race begins at 7:00 a.m. followed by fun run races at 7:50 a.m., and finally a 10 mile race beginning at 8:20 a.m. The Smudge Pot Stoll, a walking and tasking tour around downtown Medford, will stop at 9:00 p.m. Friday. Saturday’s parade will start at 11 a.m. in at Beatty and Central before proceeding down Central Avenue. It turns west onto West Main Street, and will disperse at Mistletoe. All the activities, of course, means there are several road closures in effect on Saturday. 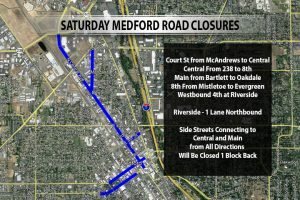 Medford public works will be closing, Court Street from McAndrews to Central, Central from 238 to 8th, Main from Bartlett to Oakdale, 8th from Mistletoe to Evergreen, and westbound 4th at Riverside. Riverside will be reduced to one lane northbound and will be using the closed lanes to detour traffic south bound from 4th to Main. And lastly, all side streets connecting to Central and Main from all directions will be closed one block back.